Description: Sexes similar. 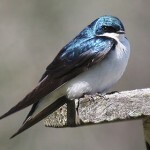 Squarish tail; buffy rump; buffy throat and cheeks; cinnamon forehead; steely blue crown; blue-black above with white streaks on back; and light below. 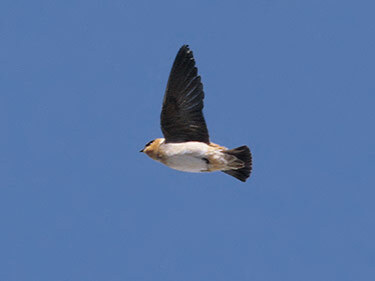 Cliff Swallow has opposite pattern: light forehead and dark throat and cheek. Habitat: Nests in colonies in limestone caves, sinkholes, culverts, and under bridges. Sometimes found nesting with Barn and Cliff Swallows. Where in Nebraska: Accidental. 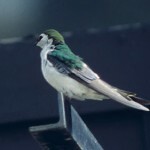 Two birds were caught and banded at Cedar Point Biological Station, Keith County, in May of 1991 and June of 1995. 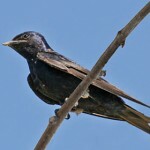 Fun Facts: Cave Swallows nest in the twilight areas of caves where there is minimal light. To find the nests the birds must fly past the nest and then turn around to see with the incoming light. Additional Information: Originally a Central American and Caribbean species, it is apparently expanding its U.S. range.